If you’re backpacking, you always want what’s on your back to be as light as possible but also able to give you the right amount of comfort and durability. Balancing these key features can be very difficult which is why getting the best lightweight backpack is important. Choosing the best ultralight backpack though can be difficult as there are many features to consider and sometimes compromises need to be made. There are also other key features to consider too, such as the volume, material and storage options. In this guide we will help to clear up all your questions to make sure you can be fully confident in buying the best product for you. We have also completed lightweight backpack reviews to show you the best products out there and once you’ve finished reading, you’ll know exactly what you want. 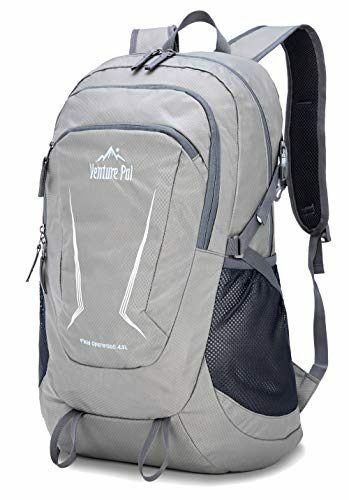 This is a top rated ultralight backpack from Venture Pal which gives you all the features you need when you’re outdoors. It comes in a large and vibrant selection of colors, which will allow you to pick the one which matches your style. The backpack is made with tear-resistant material to ensure that it remains durable and it is also resistant to water. The breathable mesh straps will help it remain comfortable on your back, even after a long day of hiking. The backpack features multiple compartments which allow you a full range of storage options with its 35 liters of space. The bag can also fold down to a very small size, making it highly portable when you are out on your travels. 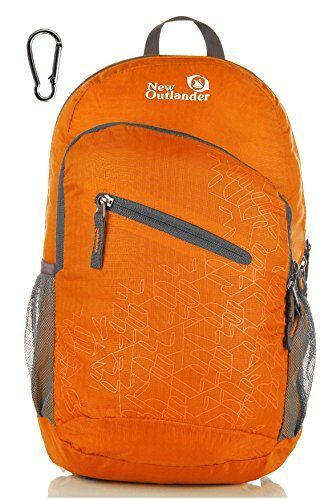 Outlander have produced this lightweight travel backpack which is perfect for hiking. The bag is very stylish in its design and comes in a wide range of color options but also size options too for various types of activities. The backpack is made from nylon which is going to be both tear and water resistant allowing you to be able to hike in comfort. The zips are very durable and this is another bag which is able to fold away for easy storage and travel. The straps are breathable with enough sponge padding to make them comfortable to carry with adjustable shoulder straps to keep it tight to your body. There are plenty of compartments to help make sure you enjoy your hiking trip. This lightweight hiking backpack is able to be comfortable to carry while giving you all the features you need. It’s slightly smaller than other options but still has plenty of room along with its very low weight at just under half a pound. It has 20 liters of storage space and is able to be folded down into a very small size. It’s made with high-quality materials which are going to be both tear and abrasion resistant with durable SBS meal zippers. It’s available in a great range of colors and is going to be comfortable to carry to allow you to enjoy your backpacking experience wherever you are in the world. This is a product which won’t let you down and will last for a long time. 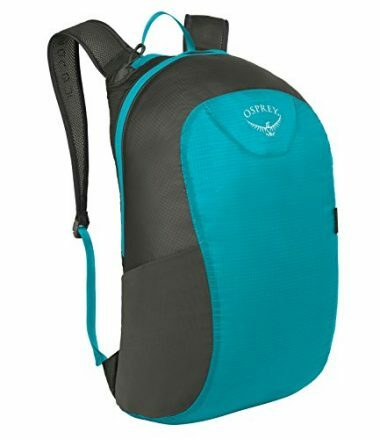 This is a classic looking backpack which has all the compartments you need for a great day of backpacking, as there are numerous pocket options available including a mesh outer pocket in which to store a water bottle. 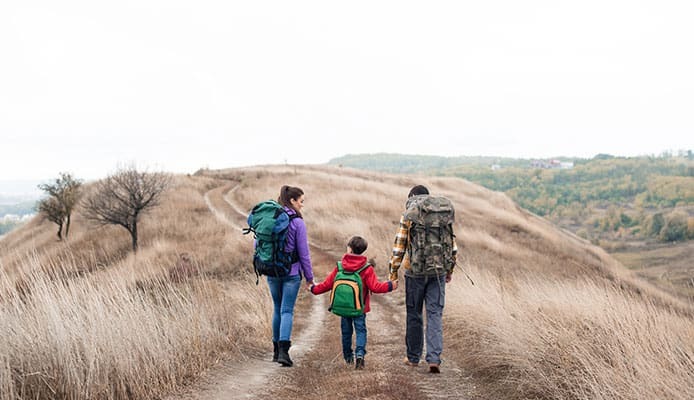 The backpack is able to put up with a heavy amount of wear and tear with its durable material and could be used for a whole range of different activities. It has 35 liters of storage space which is more than enough for most needs. This is another foldable backpack and weighs just 0.7 pounds. Even with that compact size and weight, the bag will stay comfortable on your shoulders with the padded straps which are highly adjustable and able to adapt to your body. This is a light hiking backpack which is still able to be highly durable. It’s another one which comes in a slightly smaller size but there are still many compartments available in order to store everything that you need to. It’s both water and tear resistant but the bag also has strong zippers and is reinforced in 14 different places to ensure that it stays strong. The bag also features double fabric at the bottom to reinforce the weakest area. There are two mesh pockets on both sides to give you a convenient place to store your water bottles and there is a large pocket on the front to go with the large compartments. The straps are comfortable and overall this is a very good bag. If you’re looking for light backpacks which can still store a large amount of gear then this product could be perfect for you. It has a huge 45 liters of storage space which should give you more than enough room for everything you need on a backpacking trip. You get multiple different compartments including two front zippered pockets, two side pockets and external attachment points too. The bag is made with thick material to ensure that it will last for a very long time. The straps have breathable mesh on them and are highly comfortable. The backpack is lightweight but also extremely compact making it very easy to travel with. The bag also comes with a lifetime warranty so you know it’s going to be well made. This ultralight backpacking pack is one of the best products on the market with its good design and innovative use of space. It’s made from ripstop nylon which shows that you’ll be getting a quality product which is going to be highly durable. The backpack comes with dual zippers which will be able to give you full access anywhere on the bag and features stretchy mesh pockets on either side which will be a great place to store water bottles for when you’re thirsty. It also has an air mesh harness which is going to assure you that you’ll be able to walk around in comfort wherever you are. This is another product which can fold down into its own carry case to make it very easy to transport to wherever you need to go. 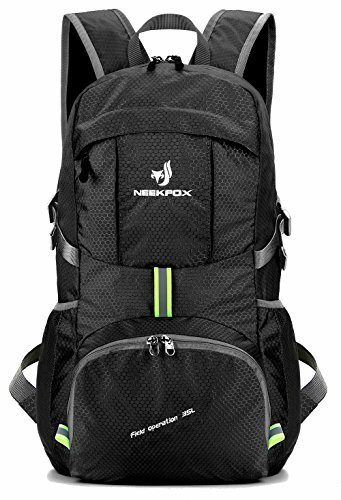 NEEKFOX are another company which have been able to develop a brilliant bag which is going to be able to give you everything that you need when you’re out there on a hike, or doing any other activity where you’re outdoors and need a backpack. There are multiple compartments which will allow you to easily store everything that you need to including your main gear and your valuables. Despite its large size it is very light and easy to carry to wherever you are going. The backpack is very compact and able to fold down into its own zip pocket. The bag is very durable too as not only is it water resistant but it has puncture resistance. This is a great backpack which will give you everything you need for a great adventure. This is a 25 liter backpack which is available in a whole range of bright colors so you are sure to be able to find something which is going to be able to perfectly fit your style. All these backpacks are waterproof in order to give you full weather protection. There are multiple pockets available for you to be able to separate all your items in an easy to use way. 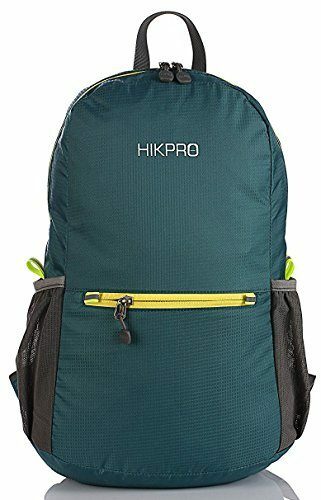 It’s a highly versatile bag which would be equally as good for running as it would be for hiking or any other adventure. They are very lightweight and can easily be taken anywhere that you want to go and then folded out ready to use. 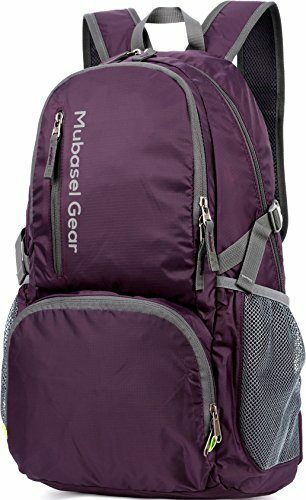 This is a great backpack which you will be using for years for a range of different reasons due to its multi-use design and durability. 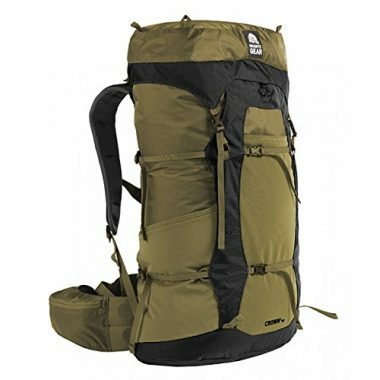 If you’re going on a long backpacking adventure and need something which is going to be able to hold all of your gear then this backpack from Granite Gear is going to be able to do the job to a great degree of satisfaction with its large size. The backpack has an incredible 60 liters of storage space which is able to carry a lot of items. Due to that it has a dual density shoulder harness with load-lifter straps to help with the weight, which can be significant when fully packed. The bag is highly adjustable to ensure that it stays comfortable and has a few great features such as a removable lid and a toll-top main compartment. The backpack also features a hydration port so you will be able to drink your water without stopping. The weight of any product is important when you are backpacking but the actual backpack itself needs to be light enough to not add too much to the overall weight of what you are carrying. If you have too much weight on your back then it could make for a miserable experience and could well cause your injury problems. When you are out there, a few items will take a significant amount of the weight as you will have your backpack, your sleeping bag, your tent and possibly a sleeping pad too. If you can get the weight of all of them down to a minimum then you could see a huge difference in the overall weight. There are a few caveats to that though as there are often compromises to be made when it comes to backpacking. Whilst you want it to be light, you don’t want it to fall apart easily and you still want it to be comfortable. In order to be durable, aspects like a thick bottom layer and reinforcements are added, and with comfort, padding needs to be added to the shoulders. It’s up to you to determine how much you are willing to sacrifice for the weight but a lot of these products are able to strike the perfect balance and be able to give you the durability and comfort that you need but while staying ultralight. If you want to focus mainly on comfort and durability, it might be worth looking at a regular backpack. This also depends on the amount of hiking that you are doing. If you are only going to be traveling for short distances, then weight it less of an issue. Over longer distances it is more important but you also have to consider that the bigger the backpack you carry, the more it will weigh and also the higher the overall weight with the gear inside. It can be hard to picture the amount of space which is in a bag, especially when you are given the dimensions of different storage spaces and even though it can be hard to picture, measuring the volume of a bag in liters will be able to give you something to easily compare different products too. If you have an existing backpack or a mini suitcase then it might be worth seeing how many liters it is and compare that to the backpack that you are looking for. That way you’ll have a much better idea of how much space you will need. Your need for volume depends on a few factors such as how light do you plan on packing your items and also the weather conditions that you are going to be in. If you are going to be a serious ultralight backpacker then it’s likely that you are not going to need a large volume due to the fact that you will be taking the bare minimum with you. If you are going to be in the cold weather though, then you will need to bring more and thicker items with you and therefore a larger volume is required. If you’re inexperienced and not sure on how much stuff you’ll be taking on your backpacking trip, then it’s best to be cautious as it’ll be much better to have empty space in your bag rather than leave anything behind that you might need. Most standard bags come in at around 35 liters which should be good enough for most trips, depending on where you are going. There are much bigger options available though but it’s always worth considering what the overall weight of a large backpack will be. A fully-loaded 60 liter backpack would take a great deal of strength to carry. The material of these backpacks is very important as they have to try and strike that fine balance between being highly durable but also as light as possible too. It’s a balance that many materials find it hard to achieve which is why you see the same type of materials coming up again and again when backpacking. When it comes to backpacking, nylon has these qualities a lot better than other materials but it is also quite inexpensive too which makes it a very popular choice, one crucial element that needs to be added to nylon though is ripstop which will help to make it even stronger than it already is. Ripstop are additional fibers that can be added to the fabric in order to make them more durable and nylon can also be treated with additional water resistance too in order to make them even better. The ripstop material is able to make the fabric not only abrasion resistant but also tear resistant too, which is essential in the world of backpacking which can often be a rough and tough environment. One fabric which can compete with nylon is dyneema composite fabric which was previously known as cuben fiber. This is actually a better material than nylon as it is lighter and more water resistance but the big downside is that it’s actually a lot more expensive which is why it isn’t widely used for backpacks. When it comes to backpacking though, nylon is still king. It’s able to come in a variety of different colors and is flexible and soft enough to be a comfortable material for carrying around all day. You just need to ensure that it contains ripstop for that additional durability. When it comes to the old traditional backpacks you would often see them having a top lid which can still be seen with larger lightweight backpacks such as the Granite Gear Crown 2 60 Backpack. For smaller bags though, this lid is often not there in order to get rid of some extra weight. Most of these backpacks can simply be opened from the top with a dual zip which will allow you very easy access but doesn’t give you the same level of weather protection as you would get with heavier backpacks which are happy to add that little bit of weight. A lot of these products have waterproof fabric but the zip can be a weak point. You want to ensure that the fastening is as secure as possible to not allow any water through and it’s also useful to check what other internal compartments it has where you would be able to store more valuable items. There is also the ability to bring your zippers down to the side so that they are not directly exposed to the rain. Other ideas include using a poncho or a rain cover for your bag but this would only really be required in the heaviest of rain. If you are actively going to be out in bad conditions, then it’s probably worth getting a specific bag for this. For their weight, these bags do a great job of being able to protect what’s inside from any water but they can only do so much. If you’re concerned about the rain, make sure to check the opening and the internal compartments to ensure that it’s good enough for your needs. The assumption when you are looking for a lightweight backpack is that you are going to try and fill it with items which are also as light as they can possibly be. These products are made with that in mind and therefore they don’t offer up much in terms of a frame. This is often seen on heavier bags where they have to have an internal structure in order to be able to support the greater weight that is going to be placed inside them. A lot of these backpacks though are able to be folded down to a very small size and be taken anywhere that they need to go. If you need to be carrying a lot of weight then it’s best to look at a bag which is going to have a sturdy frame which is going to be a lot heavier and not really ideal for taking on long hiking trips. A lightweight backpack can comfortably sit on your back for days on end. 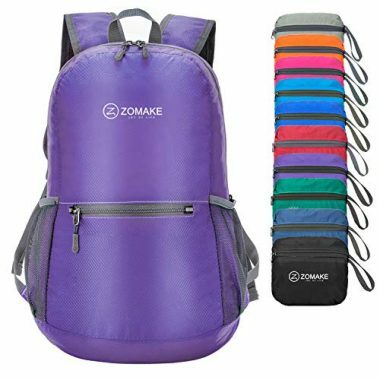 There are a few additional features which can be useful on a backpack when it comes to extra support with one of them being the backpack having weak points which are reinforced throughout the bag. This will help to keep the bag solid and ensure that it doesn’t rip easily. One area that almost always has additional support is on the bottom of the bag as this is the place that is going to take the most punishment. Having extra padding here will ensure that your bag is able to last you for a good number of years. 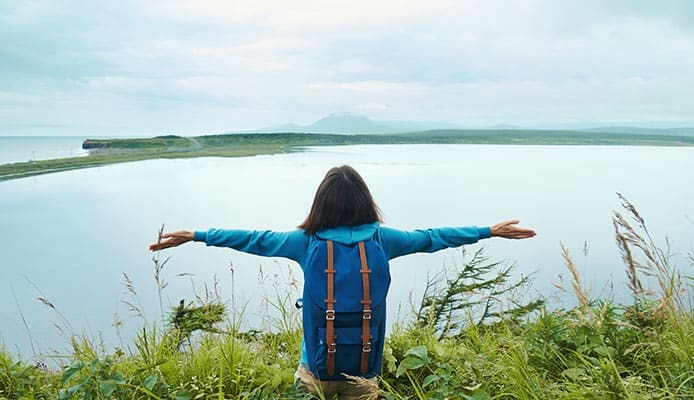 When you have anything on your back, comfort becomes a big issue as if you are on a backpacking trip with an uncomfortable bag then it can really take away from the experience. Often with comfort comes a balancing act due to the other aspects that can be affected by it, with a big one being weight. The point was made before and it’s relevant to comfort too, these products are made with it in mind that the person buying them is going to want to fill them with items that are fairly light and therefore the overall bag weight is still going to be quite low. Therefore, these bags don’t give you the greatest level of padding in the world but it should be enough to make it comfortable while you’re wearing the backpack. Even with lightweight backpacks, you still need padding on your shoulder and all products should have this level of protection for you. It also helps if they have a breathable mesh on them as well. This will help to ensure that enough air can circulate with the padding so that you don’t sweat and overheat very easily. Having this type of ventilation on the back can also massively increase your comfort levels. On backpacks which have a greater capacity, there can also be additional straps to help you carry the weight and these will either be found over the waist and/or over the sternum. These are rarer with lightweight backpacks due to the fact that they are not designed to carry a huge amount of weight. In term of comfort, you also want to make sure that the straps are going to be able to fully adjust to you and your height. If your backpack is not tightly on your body then it’s going to move around more and cause you a lot of back discomfort so always ensure that the backpack is going to fit you and that they have the straps adjustable enough to keep it tight. In terms of the overall size of the backpack you want to make sure that it’s going to be ideal for you and your circumstances. Some of these bags are a lot bigger than others and if you’re not used to carrying a big bag then it could be very uncomfortable and make for a very miserable experience. There is also the aspect of travel too which can make these backpacks really stand out from the competition. A lot of them are able to fold down into a very small size which is going to be able to fit in your hand, which means that they can be taken anywhere. This makes them great for travel where you might be staying in a central base such as a hotel or a camp and want to be able to venture out and take all your essentials with you. Being able to fold down to this size can make them highly convenient, especially for those who are traveling by air. With the size though, a lot of it comes down to common sense and making sure that you are not expecting too much of yourself when to comes to having one of these backpacks. Get one which you’re actually going to be able to carry, even if that means getting a backpack which is slightly smaller. There are a few additional features which can be found on these products. Checking them against each other and seeing which one you need can be a great way to decide between two different backpacks when you are struggling to separate them. One part of the bag where there can be a few main differences is in the main compartment as different companies will set this out in different ways. This is where the majority of your camping gear needs to so needs to be able to accommodate everything that you want to carry on your trip. After the main compartment there will be a number of different compartments. Some can be found under the main zip next to the main compartment and this is often where people will place valuables and other key items. Most will also have a front pocket too which can be useful for having instant access to booking receipts, vouchers or any other piece of important documentation. Most backpacks will also have a side pocket which are generally designed to be able to hold water bottles. This will mean that you can have easy access to your water without having to take off your bag and also without worrying that you are going to get any of the other contents wet. Other backpacks have more complicated designs and it’s whatever suits you. Some people prefer a minimalistic approach so that they don’t lose anything whereas others will be happy to have as many pockets as possible in order to be able to separate everything in an organized way. With the bigger bags, they need to have enough straps to support the weight and other features such as hydration ports can be very useful. When choosing your bag it’s good to have in mind exactly what you need. That way, you will be able to quickly cross off your list any backpack which doesn’t meet your requirements. Q: What Is A Lightweight Backpack And What Are The Benefits Of Using One? A: When it comes to backpacks certain compromises have to be made when it comes to how they are made. 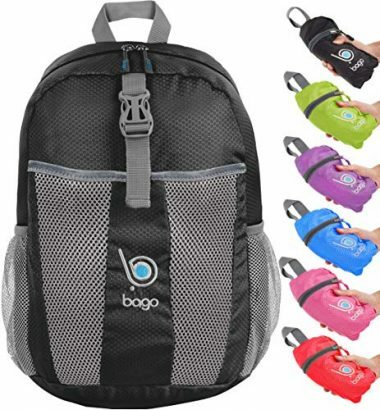 With regular backpacks, they are happy for the product to have a little bit more weight in order for them to have a higher level of comfort and also an increased amount of durability. With lightweight backpacks they specifically have weight in mind and therefore don’t have the same level of features that can be found in other backpacks. They also aren’t able to carry the same amount of weight as they are designed for lightweight backpacking. The benefits of using one is simply that you are going to have a product which is very light and easy to carry. When this is added to a few lightweight items inside it can make for a much easier backpacking experience than you have ever had due to the light weight involved. For many people this is a much more comfortable way of backpacking where they can place it over their shoulders and not have to worry about getting sore injuring your back. Some of the features that are sacrificed aren’t really important as the bag is so light. Q: How To Clean A Backpack? A: Your backpack is found to get dirty over time but the exterior of it can generally be washed pretty easily as you can simply wipe any dirt away and allow it to dry, most of the time this can be done with a damp both but mild soap can also be applied for anything which is a bit harder to clean. The process is much the same on the inside of the bag as the material will allow for the easy wiping of the materials. It’s important to not use any strong chemicals as these can damage the backpack and make it fail more quickly. You also want to avoid using any machines to either wash or dry the bag as this can damage it also. Once washed it’s best to let it air dry and then store it in a dry place until it’s time to use to product again, this will help to prevent any mildew or bacteria forming. Q: Are Lightweight Backpacks Durable? A: Lightweight backpacks so have a high amount of durability in the context of the weight that they carry. Most of them are made out of ripstop nylon which is a highly durable material and one that will not only be resistant to water but also resistant to tears and abrasions too. In terms of durability though it’s worth bearing in mind what types of products these are and what they were designed for. They are lightweight backpacks which are designed for lightweight packing and therefore are not suitable to carry heavyweight camping gear. These backpacks should be able to last you for a good number of years when they are treated properly and packed in the right way. A few additional durable features are often added to in the form of reinforcements around potential weak points and also a double-layered floor of the backpack which will be able to take most of the impact. Backpacking can be a wonderful experience but many people have been in that situation where they have been walking for a few hours and their shoulders start to ache and you can feel your back taking the strain, all the while you are probably constantly readjusting your backpack to try and make it more comfortable. 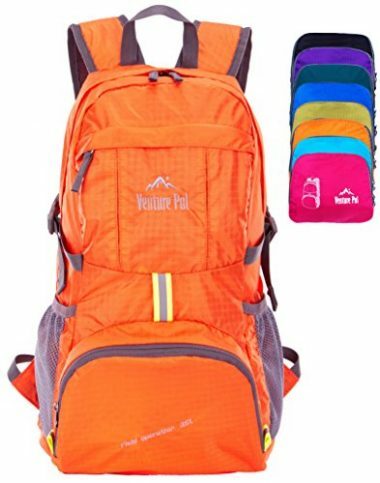 This can ruin your backpacking experience but with a lightweight bag you will be able to put those worries behind and head out into the great outdoors fully confident that you are going to be able to spend the whole day doing what you love and not having to worry about what’s on your back. Before that moment though you have to pick the perfect backpack for you and a lot of that will come down to the size of it. You don’t want a backpack that is going to be too difficult to carry and in the same breath you don’t want a backpack which isn’t able to hold all your items, finding the middle ground is going to be crucial to getting the right size. The material is going to be important in getting a durable backpack and most of these products are made from nylon and it’s important that ripstop fibers have been added to it in order to give it more durability. Once you have that figured out you can check that the backpack is going to be suitable for your needs by having the design that you want and any additional features that you need. Once you have picked your ideal backpack then you will be able to buy it knowing that it’s going to be perfect for you and your situation. This guide has hopefully helped to clear up any questions that you might have had so that you can start your backpacking adventure with a light and comfortable bag, which is going to make your adventure even more enjoyable.